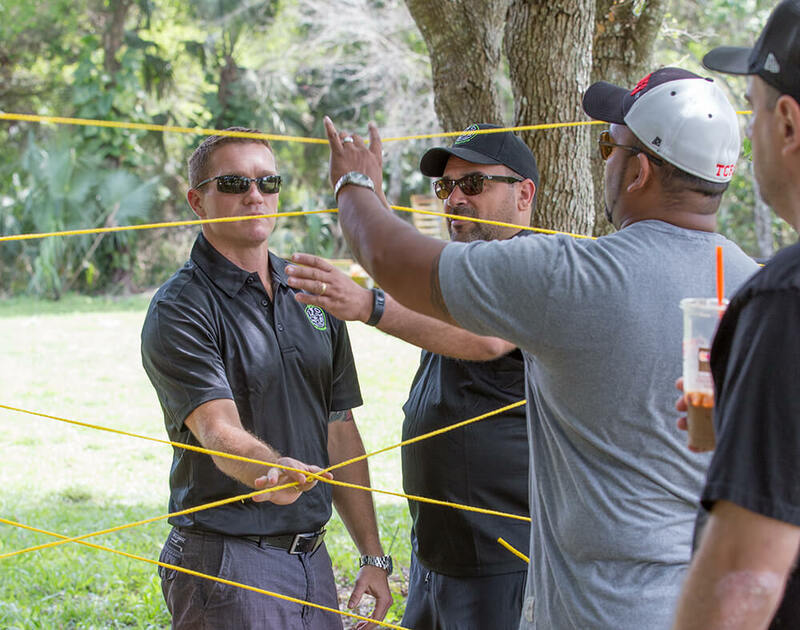 Thrill your team with fun, exciting, and unique team building experiences designed to build trust, confidence and teamwork while producing better communication, improved productivity and increased effectiveness. From extraordinary trust-building & bonding experiences to content-rich team development programs, your event will be custom designed with your desired results in mind. Bonding: Does your staff know one another? Are they friends with each other? Do they all get along? If not, this could be one of the reasons for a lack of productivity. When your staff feels a real bond with each other, it can improve the mood of the workplace. One of the benefits of a team building day is that it brings your staff together so that they can bond, foster relationships, learn each other’s key skills and form a proper working relationship. Shared Goals: Large organizations in particular can be difficult to keep track of. Each department has their own goals, but each goal forms part of a collective goal. To help each department share in this collective goal, what better thing to do than hold a team building day? Each department can get to know one another and understand the way everyone and everything works. This means that everyone is more focused on the shared goal, and it could even lead to collaboration and a more vigorous and concerted effort. Collaboration & Morale: You will notice increased collaboration among your departments after an effective team-building session. Barriers to working together will be reduced and obstacles to cooperation will be eliminated. Working together in team-building activities helps your departments to understand what each individual needs from the other members of your company. Actually practicing collaboration techniques in your team building session also provides ample opportunities to learn how to work together to accomplish a goal. Truly understanding the needs of each department member is an additional benefit of your team building program. Culture: Your employees will have the opportunity to experience and practice your culture during their team development session. Through activities and events, your associates will experience the values of your company and also have the chance to use these values during activity. By using these values with their coworkers, your employees will begin to understand your culture and values and why they are important for success. Greater Job Satisfaction: These days, employees are often asked to work more than ever. This can lead to stress, a lack of productivity, as well as dissatisfaction. To reduce dissatisfaction in the work place, a team building exercise is a great place to start. It will get your employees more involved in the business and its success, and it can help to build morale. Moreover, a team building day shows that you care about your staff, and that you want to get them involved. In this way, they will feel more satisfied, and their productivity will increase. Increased Productivity: If your employees are asked to work day in/day out without a break, they can become too stressed to work to the same levels they once were. Their work becomes mundane and stultifying. A good way to allow them to recharge their batteries is by hosting a team building day. The benefits of a team building day include a reduction in stress, and it gives your employees the chance to have a day off from answering emails and phone calls all day long. It gives them much needed respite from the stress, and it refreshes them, both mentally and physically. When they return to the office, they will do so with renewed vigor and enthusiasm. Communication: Team building can significantly improve communication among the people in your company. A properly designed and delivered team-building activity will improve the way your people interact in your organization. Skills and techniques are practiced and improved through team building activities and your associates will discover how each department works. Communication in all its forms, from email to face-to-face meetings, are practiced and analyzed for effectiveness. Once every employee understands the needs of other associates and departments, communication among your people improves almost immediately. Commitment: Commitment to your company and your corporate goals can also improve with team development. When everyone attends a company team building event, company bonding occurs and this commitment strengthens your company. Team building results in everyone pulling in the same direction. By actually experiencing this feeling through team building activities, your team understands what can be accomplished when everyone pulls together for a common goal. Understanding what is important and building a team to accomplish goals, is easier when everyone has experienced exactly how to accomplish it in a team development session. This is our premier team building experience! Master’s level and credentialed mental health therapist to facilitate all groups. This training and background provides the facilitators with increased insight into relationships and social dynamics. Allows for more interesting and in depth analysis of team dynamics. Consultation with supervisor prior to team building event. This allows us to collect information about your team so that we can customize the programming. Usually this is done over the phone. Certificate of Completion for all participants. We do not provide accommodations but can provide recommendations if your organization is not local. Meals are not included but can be negotiated. All of our services are available to out of town organizations. Travel expenses would be included in initial quote.